MUHLE LISCIO Safety Razor white, Is a storm trooper of a razor. Using it’s 78 g to It’s 105 mm in total length feels perfect. Also shaving with this handle shape provides a unique grip which improves the shave. The materials are acrylic and plated chrome also remember this is a razor taking double edged blades. Check out our accessories page and choose from a great range of brands. 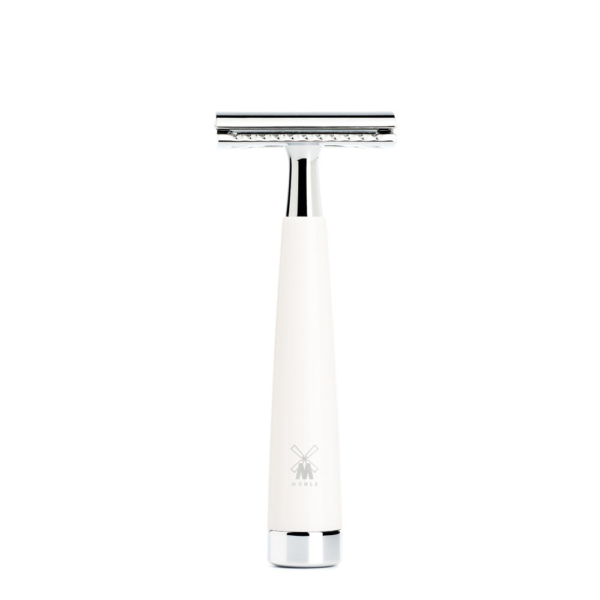 The MUHLE LISCIO Safety Razor White, comes with a free blade. Which will last a week of shaving. 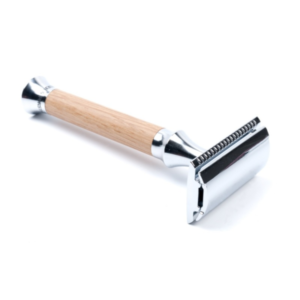 Muhle have there home brand of safety razor blades. Which are the perfect firm blade for the razor. Muhle make very strong razors, we are yet to have one returned. They are a German company who first formed In 1945. To this day they make an excellent range of gentlemen’s shaving equipment. 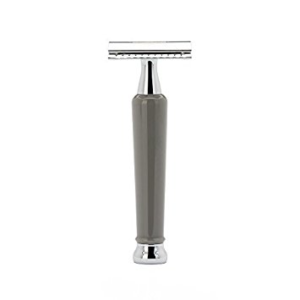 They are best known for there well priced top quality razors. Also Muhle razors are often middle aggressive, and closed comb. This make this Liscio, a good all rounder, so to speak. It will take off all length of facial hair, and it is a good every day razor also. 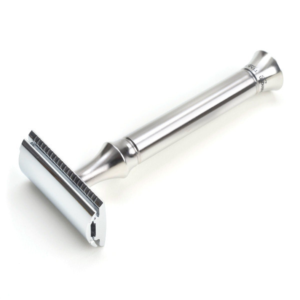 There are some real pro’s to using a safety razor, they are cheaper. They are also eco friendly due to the disposable blades being steel, a very easy material to recycle. A lot of plastic ends up In the sea too, as we have realised In recent years. Shaving technique is a bit different with one of these fine shaving devices, small strokes is a good thing to remember. I would also deploy these small strokes on loose skin. I’e not the tight barber image of a flat surface. I also wouldn’t blow out my cheeks either. In fact forget everything you think you know about shaving and read our latest blog which Is a comprehensive way to shave with a safety razor.